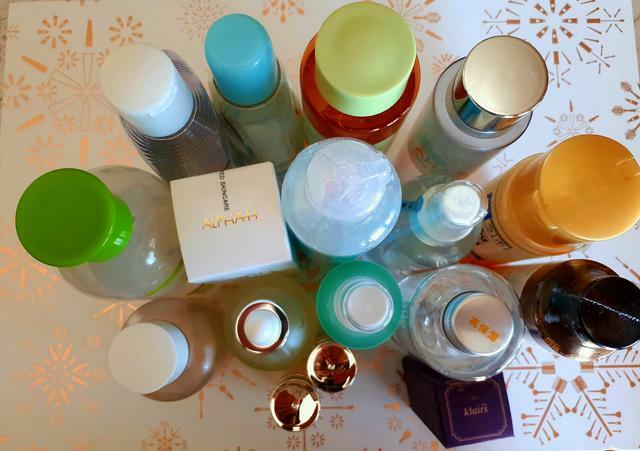 As the title of my post indicates, this is the 2nd part of my post about toners and this time, it is about the ones which are waiting to be opened. I already mentionned in my previous post, that the toners are my favourite part of the routine and that’s why I have so many of them. You name it, I buy it 😁 seems to be my philosophy when it comes to the toners. I always have a few on my wish list, while I’m always waiting for the postman to bring me 1 or 2 new ones. So, I have 8 toners which I currently use and today you will see my real stash of toners. Some of them are repurchased item, some of them came as a result of an impulsive shopping and some were a longtime yearning. Muji Mujirushi Light toning water High moisture: This is a repurchased item. I alternate it with Pyunkang yul mist toner, because I love both and cannot decide which is better. It is a great toner, highly moisturizing as its name says. My skin feels great, moisturized throughout whole day. Isntree aloe soothing toner: Honestly I do not remember why I bought this one, I probably bought it on a whim 😁 However, I read lot of nice reviews for his “brother” hyaluronic toner, so this cannot be bad, I guess? 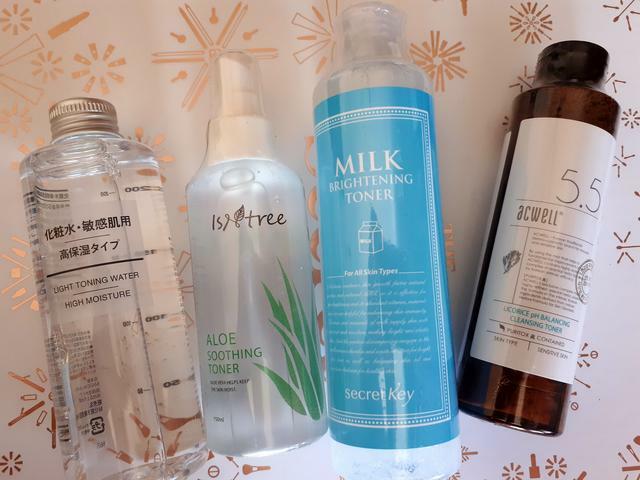 Secret Key Brightening Milk toner: I read a lot of favorable reviews about Secret Key toners, so I kept this longtime on my WL. Basically I wanted to try first the aloe version, but since I have another aloe toner in my stash, I bought this milk version. I have high hopes for this one. Acwell 5.5 Licorice ph balancing: I read a lot about this toner, especially from Charlotte Cho from Soko Glam. She induced such a hype that, at one point, I read that there were more than 2.000 people on waiting list !!! OMG! Off course, I wanted to try it, but it was not available anywhere, so I forgot about it. But when I saw it in my feed on Ebay, I clicked on it instantly. I have really high hopes for this one and hope that it won’t be a disappointment. Klairs Supple preparation mini size 30ml: I tried a small decant of this toner, so I bought the mini size bottle to test a little bit more. Ohui Miracle moisture softener: I loved the softener from SU:M37 Summa Losec line, so I wanted to try another one. Apparently, this one might be even better than Losec. We’ll see! 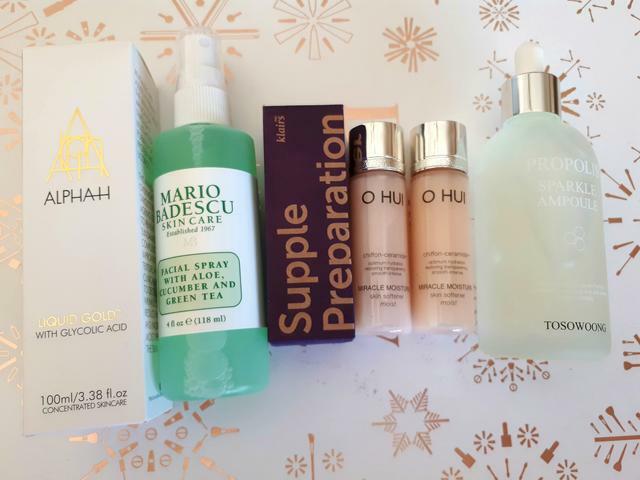 Alpha-H Liquid gold: I wrote about it in my Empties post. This bottle will wait for the autumn. Mario Badescu facial spray with aloe, cucumber and green tea: I kept it for a longtime on WL. We will see soon if it is worth a hype! And a little bonus track, sorry toner 😂 I also have a bottle of Tosowoong Sparkle propolis ampoule. Although it is an ampoule, I consider it a toner since it’s a light, perfect hydration which sinks in the skin just like a toner. This is also a repurchased item. While I was preparing this post, I emptied a Pyunkang yul mist toner, so one of the above will be opened very soon. Which one would you open? What toners do you use? Till next time, stay beautiful and healthy! Next Post Only 10 items on my Ebay WL!! How is it possible?